This seems to be the week for The Walking Dead Season 3 teasers. While the zombie drama series isn't set to return with new episodes until this fall, we got our first look behind the scenes yesterday, which revealed the very worn and dirty looking cast. And today we get a better look at a character who was revealed but not properly introduced to us at the end of Season 2. Check it out ahead and consider yourselves spoiler-warned! During the finale for Season 2 of TWD, Andrea found herself in a very bad situation as she was being chased down by walkers. Just as it seemed like her luck had run out, she was rescued by a hooded figure accompanied by two armless walkers tethered to her. 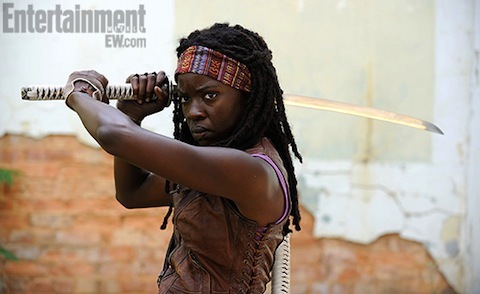 While the figure's identity wasn't revealed in the show, we soon learned that she's Michonne, a character from the comic book on which the show is based, and is set to be played by Danai Gurira (Treme). Now, thanks to Entertainment Weekly, we have our first proper look at the character, sans hood. Not having read the comics, I'm very excited to get to know Michonne, whose introduction was one of the high points of the finale. As EW mentions, Michonne proves to be a "powerful ally" for Rick, and given the lines we've seen drawn and how things ended with Season 2, he could use some powerful allies. It'll be interesting to get to know Michonne and see what kind of interaction she has with Andrea, who seems like she could use some inspiration and leadership, especially considering Shane is gone. Maybe Michonne will offer that in some way? The article also quotes Kirkman as speaking very enthusiastically about the prison, which we also glimpsed in the distance during the second season finale. You can read what he had to say about that here.